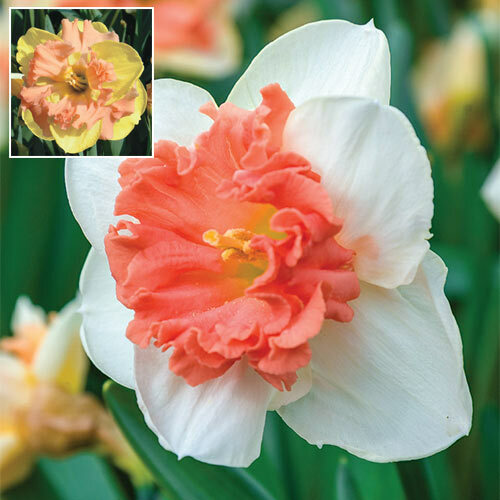 Introducing a new large-cupped daffodil that is sure to turn heads. Vanilla Peach is a treat with its rare color combination that features snowy white outer petals that readily mature to soft yellow, and sweet pink ruffled split cups. A large planting of these exotic beauties makes a stunning focal point in the mid-spring landscape, though they are equally welcome in seasonal borders, mixed beds and cutting gardens. Your customers will enjoy plenty of blooms to create fresh arrangements and cut-flower bouquets, too. Vanilla Peach naturalizes with ease, returning yearly in greater numbers. Plant in well-drained soil for best results.